Gout and Water: How Much Water Do You Need to Drink? Gout and Water: Can Drinking Water Help? You’ve probably heard water helps in the fight against gout, but here’s the truth about gout and water. Water is one of the simplest, most accessible natural remedies for gout. Drink enough of it a day to keep the excruciating pain of gout attacks away. Not only does it serve as a good lubricant for the joints, but it also helps dilute uric acid which is the cause of gout. Fewer crystals are likely to form in the body making it easy for the kidneys to excrete the acid. If the body is not adequately hydrated, the density of uric acid in the blood rises, making you more prone to gout attacks. Also, dehydration can also have multiple effects on the kidneys. Gout sufferers know all too well the importance of kidney function when it comes to gout symptoms. Poor kidney health might make it harder to excrete uric acid which is essential to avoiding those mercilessly painful gout attacks. Water helps you maintain a healthy weight which is essential to managing gout symptoms. If you are overweight and you want to lose weight, increasing your water intake is a good place to start. Water aids with exercise. Physical activity for gout sufferers is essential to keeping a healthy weight and promoting joint strength but make sure it’s complemented with water. It helps replenish the fluids you lost from exercise. Water helps the kidneys flush out harmful toxins from the body. Certain foods, like meat, for example, contains essential proteins that help the body function properly. With proper hydration, your kidneys are more capable of separating waste products from the protein. If you’re on a high-protein diet, consider increasing your water intake. 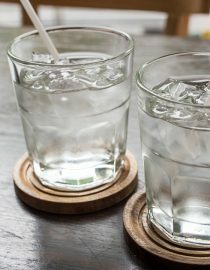 Some common questions about gout and water include: what drinks can I drink and not drink with gout? Is coffee or tea better for gout? And how much water should one drink per day? Are There Other Fluids I Should Be Avoided? Alcohol and sugary drinks are the top things to avoid if you have gout. Alcohol, especially beer, is a huge dehydrator and contains lots of purines which the body converts into uric acid. Uric acid builds up and turns into crystals deposits in your joints, causing immense pain during attacks. Certain sugars, too, like fructose and high fructose corn syrup break down into purines contributing to high uric acid levels. Also, sugar has been associated with obesity which is another risk factor for gout. Being overweight means, the body produces more uric acid, but the kidney is not able to excrete as efficiently. Avoid these drinks as much as you can; if you do, only take it in moderate amounts. You might also like...Can You Drink Coffee With Gout? What About Coffee or Tea? Many believe coffee and tea are dehydrating due to their diuretic effects. However, that is not the case at all. Recent studies have found caffeine to be beneficial for gout. This is because the caffeine found in coffee and tea has a similar structure to allopurinol, a medication used for managing gout. Take note that this might mainly benefit those who do not have gout yet but drink caffeine consistently. If you only drink it occasionally, you might experience more gout attacks just like you do with allopurinol when you first start taking it. How Many Glasses of Water Should I Drink in a Day? The standard recommended amount is 8 to 12-ounce glasses of water daily. For some people, this can sound intimidating. Try drinking it in small amounts throughout the day. Spreading it out will make you feel less overwhelmed by all the water you have to drink. Next page: Adding flavor to your water, how do you know if you’re hydrated enough and more.